It’s been an exciting day of competition at the Land Rover Horse of the Year Show in Hastings with German course designer Werner Deeg producing plenty of exciting jump-offs in the Premier Jumping Arena. Cambridge horsewoman Rachel Malcolm and Monte Carlo MVNZ took the honours in the AHD Six-Year-Old of the Year class, heading home 40 other combinations. Eleven came through to the jump-off where five kept their slates clean. Maurice Beatson (Dannevirke) and Central Park were the first to come home clean, stopping the clock at 53.86 seconds. Samantha Peters (Northland) and Cadillac NZPH raised the bar with their clear in 52.27 seconds. Robert Steele (Dannevirke) and Two Eye See gave it their best shot but came up slightly shoot with their 53.71 second time. Lucy Fell (Palmerston North) and Big & Rich couldn’t match it, stopping the clock at 54.23 leaving it up to Malcolm who flew home in 48.76 seconds to take the honours. But Malcolm was quick to share her victory, thanking her team and Monte Carlo’s breeders Mount View Sport Horses. The fulltime rider is known for her patience and ability to produce young horses. She was thrilled Monte Carlo had peaked at the right time. “He is a bit of a pro and knows his job,” she said. The goal has been to keep the horse fresh and happy. Malcolm has had the horse since he was just two and the plan for the class had been to be as efficient as could but still give him a good ride. Malcolm last won a title at HOY in 2009 when she took out the Young Rider crown. 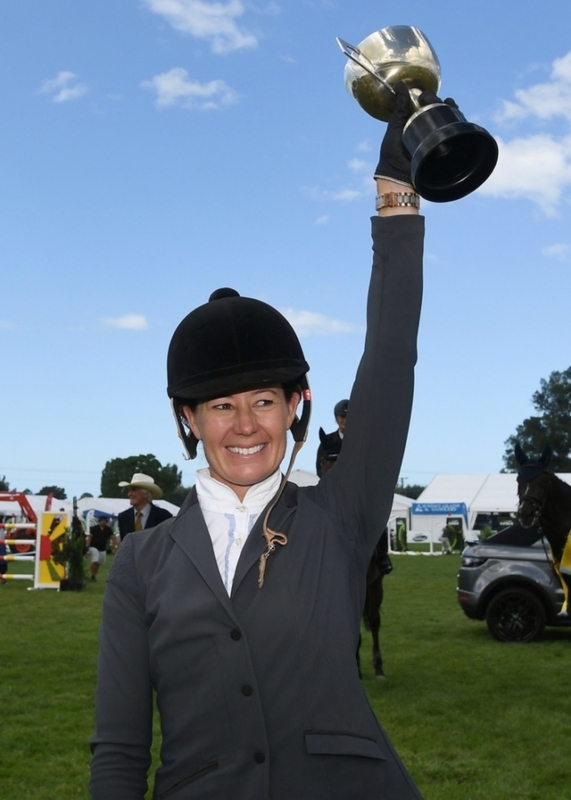 Former eventer Kate Cavanagh (Geraldine) won the Wade Equestrian Amateur Rider of the Year class in style aboard Wallflower. 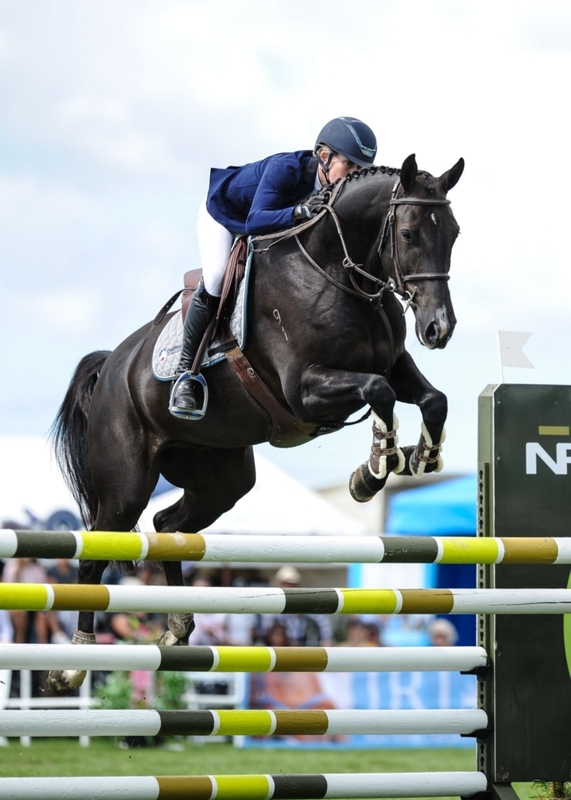 The South Island combination were the first of five to come out in the jump-off where all left the rails in place but none could match her 47.31 second effort. Anna Stephen (Martinborough) and Lollipop SP came in for second in 47.82 with Olivia Crozier (Canterbury) on La Fonteyn third in 47.96 to round out a very tight top three. Cavanagh opted to start in the amateur rider over the six-year-old class because she hadn’t put Wallflower against the clock but the combination showed plenty of class en route to victory today. And it wasn’t that long ago that the horse would have struggled to get through the start flags. Wallflower is named for her wall eye and as a tip of the hat to her mare’s line – she was bred by the McVean family and is by Corofino II, out of Double Dee, who is out of Flower Power. Cavanagh bought the horse as a newly-broken four-year-old. She hasn’t completely given up on the idea of eventing, and says if she could find something special to produce for the sport, she would. AHD Six-Year-Old of the Year as part of the Mitavite Six Year Old Series: Rachel Malcolm (Cambridge) Monte Carlo MVNZ (by Indoctro out of Auburn Princess MVNZ) 1, Samantha Peters (Northland) Cadillac NZPH (by Jokus Latour) 2, Robert Steele (Dannevirke) Two Eye See (by One Eye out of Mrs Grey) 3, Maurice Beatson (Dannevirke) Central Park (by Euro Sport Centavos out of Silk and Spice) 4, Lucy Fell (Palmerston North) Big & Rich (by Cardento out of Dolly) 5, Jesse Linton (Hastings) Vitess (by Centavos out of Diversity) 6. Wade Equestrian Amateur Rider of the Year as part of the Caledonian Holdings Amateur Rider Series: Kate Cavanagh (Geraldine) Wallflower 1, Anna Stephen (Martinborough) Lollipop SP 2, Olivia Crozier (Canterbury) La Fonteyn 3, Kaleigh Kent ( Otane) Double J Sponge Bob Square Pants 4, Kelly Hawkeswood (Auckland) Larinium LS 5, Shelagh Nolan (Gisborne) Ngahiwi Eyeza Blue 6.